Do you want to know how long the line is to register that new car? Looking to see how long it takes to get an unflattering license photo taken? "Mass RMV" provides Massachusetts Registry of Motor Vehicles locations and current wait times for licensing and registration. Don't wait in line for hours only to find out you forgot a piece of documentation. 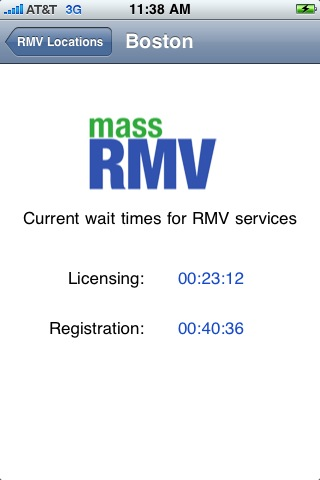 Look up wait times at your local RMV.